For long periods of time, oatmeal is the only thing I eat for breakfast. Every darn morning. It started with a poor personal economy, and continued as a love of silky, nutty and warming breakfast bowls. I love the ritual of cooking up something steamy and fragrant in the morning, slicing up crispy fruits and thawing berries while the oatmeal is simmering on the stove, arranging it all in my favorite bowl and topping it with a generous dollop of decadent nut butter and a splash of sweet plant milk. It’s such a simple ritual but one that comforts my reluctant morning mood. Finding the perfect balance of textures, spices, temperature and flavor combos in oatmeal is truly an art. Because it can be a pre-tty boring food as well. 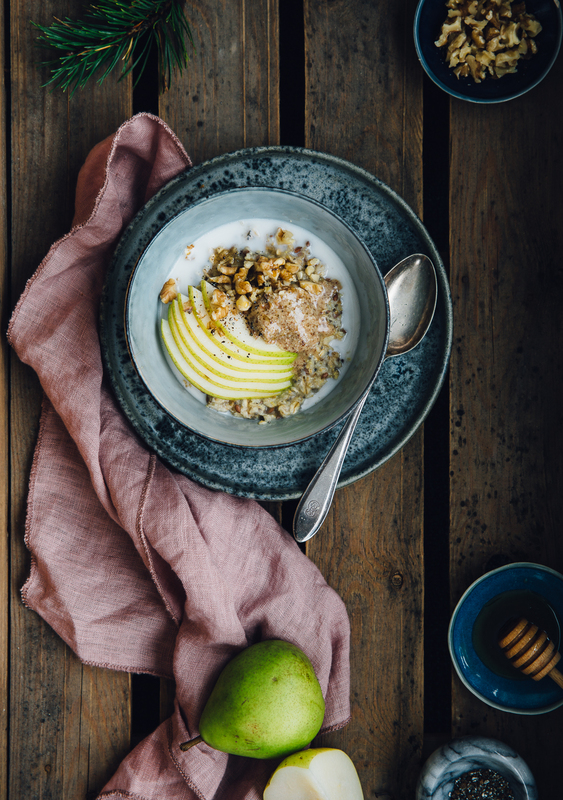 Further down in the post I’ve listed 4 essential things to keep in mind when making the perfect (well, at least according to me) bowl of oatmeal. But first. You might have noticed that the Swedish translation is missing from the title. Here’s the deal: Cashew Kitchen is growing to something big and exciting. Behind the wheel it’s only me, and the hours per day I have are limited. I’ve been thinking for months and months about what things I can cut in order to make space for new projects. I wanna educate myself in business strategies and explore plant based cooking further, brainstorm new ideas or even dive into a completely unrelated hobby project every once in a while, but this double language thing has taken up most up my time for more than a year now, and honestly been quite draining. It’s like, when I’ve spent half a day in front of the computer writing a blog post and I think I’m done, then I have to write it all again. Understand me right here; I love writing! But when I’m writing my text for the second time, it’s not as fun anymore. Instead I could be channeling that energy towards creating better content for you guys, or adding an extra blog post to my weekly updates. So, I’m dropping the Swedish now. Sorry Swedes!! But I know that most of you are super skilled in English. You’ll be fine! It’s like second nature ;-) In case any one of you need a recipe translated, just send me a message and I’ll fix that for you! As for the recipes, I will write both European and American measurements. 1. Coarseness of the oats. I always use a kind of rolled oats that are called ”rough” in Sweden, meaning the flakes are slightly thicker cut. I find that this makes the whole difference! Many brands make rolled oats that are more like tiny, crushed pieces of oats. Personally I don’t like that at all, as the oatmeal is more likely to get soggy and doughy. 2. Fat. To prevent that sticky dough-quality I mentioned above, we need some fat to smooth it out and prevent the oats from sticking together too much. Coconut oil does not only make the oatmeal wonderfully silky, it also makes it taste better :-) 1/2 tbsp or so per person should do the trick. 3. Texture. In order to preserve the texture of the oats I like to pre-boil the water and stir the oatmeal as little as possible. Otherwise it is easy to end up with a soggy mess. Adding seeds to the oatmeal also makes for some interesting texture variety! I like flax and chia right now because it helps with the smoothness I mentioned, and the chia seeds provides some essential fats and protein. You can also try adding sunflower seeds or desiccated coconut. 4. Salt. Most important thing! Porridge without salt is simply inedible. Period. But too much salt is also horrible. Here you just have to try your way forward and find a good balance for you, given the kind of salt you use. I generally avoid table salts and instead use a milder mountain salt called Himalaya salt. Sea salt also works, but it’s more intensely salty than mountain salt so be careful. Notes: I highly recommend buying cardamom seeds and grounding them yourself using a mortar and pestle. It tastes sooo much more than store bought ground cardamom! In a small sauce pan, heat up the water so that it’s hot but not boiling, then lower the heat to lowest. Add all ingredients for the oatmeal and give it a careful stir to combine. Let the oats swell/simmer for about 2 min. Give it a stir once or twice but don’t stir it more than you need to. You can add a little bit extra water if it feels too dense. The oatmeal is done when it has come together to a porridge but is still just a liiittle bit runny. Set aside while prepping the topping. 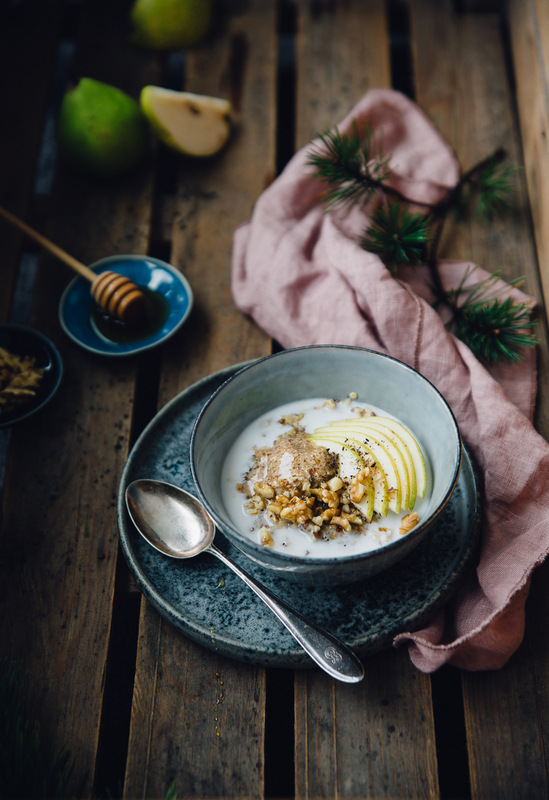 Scoop up oatmeal in two bowls and top with sliced pear, chopped walnuts, runny honey, a dollop of nut butter and a good splash of nut milk (I recommend hazelnut or almond). I TOTALLY understand you. A lot of my readers don’t speak English – seriously??? wft – and I HAVE to write twice. And I hate it. Especially when I want to lose myself chatting longer than the usual – as in the latest post. Unfortunately I have readers that even when I write something uber-simple on Instagram, as ”working a new recipe” they message me ”where’s the recipe? Oh you’re still working on that, sorry but I don’t understand English” :O I’ll comfort myself with your porridge. UH I understand that’s a huge problem for you then. And that you have to write in two languages. I also noticed I restricted myself in the text because I didn’t want it to become too long. Maybe you can keep one part of the text a little shorter, for example you have a long english text and then a quick explanation in your mother tounge? Fjällfil, müsli och skivad banan samt lite bär är min grej, OM jag äter frukost.. haha. Tycker det känns SÅ du att det bara är på engelska faktiskt. Och fint med nya headern och bilden i sidomenyn också! Åh vad skönt att höra! Känns väldigt bra hittills. Så mycket mer effektivt jobb och mer andrum för mig. Förstår verkligen att det tar för mycket tid att skriva på två språk, engelska fungerar ju utmärkt. Jag skriver oxå endast på engelska :) Dina bilder är fantastiska! Vad skönt att höra :-) tack!! Vad brukar du toppa din havregrynsgröt med? Hej! Jag använder de som heter ”grova havregryn”. Vet t.ex att ortekram har dem :-) men vanliga funkar förstås också! Nice recipe! We eat oatmeal with fruits and nuts everyday, too, and I like variations. Having a bilingual blog is a lot of work, and I found that audiences are also different. I like introducing my favorite American recipes to Germans and vice versa, therefore I have 2 blogs and posts are often different.